Meeting the world’s surging energy demand has become a difficult issue today. Energy efficiency thus becomes a critical way in solving the situation as well as building a low-carbon future. 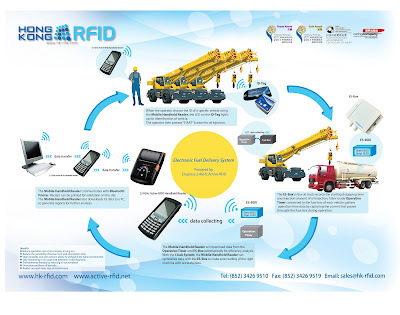 Our latest active RFID application - Electronic Fuel Delivery System (EFDS) is going to contribute significantly with its unique features and functionalities through automating and improving the operation efficiency of the fuel injection process in the oil and gas industry. In the oil and fuel industry, most companies are using the barcode system for the process of fuel injection. However, the barcode system has shortcomings that these companies can no longer bear. Not only is the barcode easily damaged, the process of finding the barcode and reading it is time consuming. Not to mention the data collected is often inaccurate, which makes it extremely difficult to manage and monitor the fuel injection process. Before implementation of the EFDS, there is no method for businesses to gather vehicle operation time data in an automated manner and cross reference such data with fuel consumption data from flow meter for efficiency analysis. With the EFDS, all these problems can be solved. EFDS integrates advanced active RFID technology and customized hardware design to enhance operation efficiency of the fuel injestion process. With the installation of ID tag on vehicles, operators can identify target vehicles conveniently with the Mobile Handheld Reader for fuel injection. The ES-Box and Operation Timer provides fuel injection time and amount data as well as vehicle operation time data to the Mobile Handheld Reader automatically. Such data would be loaded to a PC afterwards to generate efficiency reports. Any inefficient use of fuel can be detected in timely manner. The implementation of EFDS, will thus, help the industry to automate the whole process and control oil consumption, which in turn improve overall efficiency and reduce operating costs. Please contact our Sales Representative if you need more information: Contact Link.